(November 22, 2010) – I was apprehensive about seeing “Faster” (CBS Films – Rated R) which opened Wednesday, nationwide. It’s an action film with a revenge story, and all too often this genre takes killing to a scale that leaves me feeling as cold as the plot. Director George Tillman, Jr., however is the reason to give the film a look. 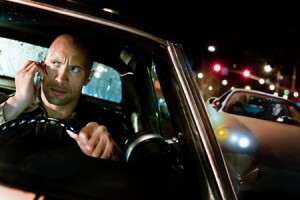 He takes an action vehicle for Dwayne Johnson, the pro-wrestler turned actor in the role of “Driver”, and skillfully weaves three stories into one. The story stems from a bank robbery involving Driver, but then are held up by another outlaw group that killed his brother in cold blood. Released from prison after 10 years for the robbery, Driver now roars around the around the desert southwest in a 1970 Super Sport Chevelle, packing a Redhawk Alaskan Ruger ‘Bear Killer’ pistol, as he bumps off his brother’s killers one-by-one with methodical precision. Only a fan of extreme violence could identify with Driver on his single-minded mission – were it not for a few glimpses here and there of his more innocent and kindhearted past. He is also willing to do the right thing when the occasional opportunity to spare a cop or an innocent bystander comes along. It also helps that Driver has almost supernatural qualities. This allows the viewer to look past his path of iron-willed revenge by seeing him as “a ghost” as he is called by a Samoan bodyguard who looks at his tattoos and refuses to confront him. A by the book policewoman, Cicero, played by Carla Gugino, is on Driver’s case together with her veteran but flawed partner, “Cop”, played by Billy Bob Thornton. Then enter self-made hitman, “Killer”, played by Oliver Jackson-Cohen, who has his egocentric battles with ambition and sanity – who confounds police as a secretly hired killer after Driver. Killer is sort of a bad James Bond with impeccable looks and a budget to match. He chases Driver in a Ferrari 360, carrying a more sophisticated H&K P30 pistol with a silencer. Finally, there is the story of Cop, and his spouse, Marina, played by Korean American actress Moon Bloodgood. It’s a small role but it’s key to the plot as it stems back to her days as a Los Angeles snitch for her gangland detective husband Cop. The two are now separated and trying to stay off of heroin. Without the mutual love for their 8 year old son Tommy, the two would have been consumed by their twisted pasts long ago. “It’s not a huge part and I think they have cut some scenes,” said Bloodgood during a phone interview from Los Angeles. Her scenes with Thornton are intact but others with Maggie and Oliver did not appear at the screening. Bloodgood said she enjoyed working with Tillman, and was also pleased to see an African American director getting another big studio film. A Milwaukee native, Tillman earned his way to the top with a series of successful low budget films that earned big dollars with distributors. He went on to direct Men Of Honor, Barbershop, and it was “Notorious”, the 1999 film about the late rapper Notorious B.I.G. She said Tillman is dedicated to the production and liked how he would take time to share his vision for the film, about how he would set up certain shots designed specifically to match the personality of the key characters. Bloodgood said the film was a great opportunity to work with Thornton, an actor she has admired his films ever since “All The Pretty Horses” – his third directorial project in 2000. She appreciates his humor and that he is also a quiet, thoughtful person. Bloodgood contrasts the “dry and direct” style of Thornton to the more “playful, softer and sweeter” style of Dwayne Johnson. “They got along really well and I think this is a really great role for Dwayne, something different,” she said. “I think every actor wants to do something dramatic and he’s great at the action stuff. Bloodgood is the daughter of a Korean mother who married the American soldier that would become her father and give her a mixed Dutch and Irish ethnicity. Bloodgood became a professional singer and dancer and was once a member of the LA Laker Girls team. She toured with Prince, Brandi and Offspring. Her modeling career led to contracts with Revlon, L’Oreal and Avon. She never really wanted to get into acting but all along she was urged into roles by casting directors until she reluctantly agreed. As a bi-racial actor she said it has its advantages when the part calls for an ethnic role. It also has its disadvantages when competition for various non-specific ethnic priority roles creates an unhealthy atmosphere among actors of color amidst a largely Caucasian casting model. She is pleased with the current level of opportunities for ethnic women and men in leading roles. She would like to see more Asian males in leading roles and believes that this barrier is starting to break. Bloodgood is pleased that 2010 has brought a variety of roles on stage, in Faster, and will be a cast regular role in the new TNT series “Falling Skies” with Noah Riley and produced by Steven Spielberg. “It’s a post-apocalyptic show with aliens taking over the world,” she said. Next, she would like to try her hand at comedy. Look for Bloodgood to appear soon in the independent film, “Bedrooms”. “I am really actually proud of that movie because it deals with the complications of all relationships and all of the levels and all of the different dichotomies and complexities,” she said.